Once in a while you chance upon something that makes you feel warm and fuzzy. We had the pleasure of such an occasion last week on our drive back from visiting family and spring snowboarding in Montreal. Where I grew up, we have the Turnpike and Parkway but here it’s all about the 401. A means to speedily (some more speedily than others, ahem) travel from Toronto to Montreal, with time only for a few quick pit stops, most people don’t venture into the little towns scattered around the highway along the way. Lucky for us, Sanj had a meeting in Belleville and so we, along with a visiting and newly engaged cousin from England (congratulations Radhika), spent a wonderful evening in a beautiful town. Belleville even means beautiful town in French! Since Sanj is in the food business, our little side trip started off as a tour of a cannery, Sprague Foods. Similar to the opening sequence of Laverne & Shirley, except with cans, we were really impressed by the operation. Seriously, how often do you think about the canning process? It’s pretty neat and thankfully, super clean! On our way to dinner, I stopped into a quaint used furnishing store, Funk & Grüven and was so thrilled to spend time getting to know the owner, Mark Malachowski and his employees. I actually LOVE small talk. Some people garden or skateboard, but my favorite hobby is small talk. Pleasant, unobtrusive conversation that’s non threatening, warm and makes people smile? I’ll take one of those, please. You learn a lot more about people then you think when you small talk and I love it. I also love great finds! 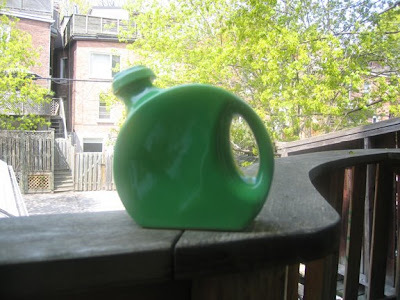 I bought this 1950’s pitcher while in the store for $30. The color stood out in the store and matches our new lights but what I really love about it is the shape! We had dinner with Rick, the owner of Sprague Foods and his wife, Jane at a restaurant with fresh, homemade, locally stocked produce (I’ve been watching too much Gordon Ramsey), the Dinkel Family’s “Paulo’s Italian Trattoria”. High school sweethearts and married for 25+ years, Rick and Jane were one of the nicest, most sincere couples we’ve met in a long time and it was a pleasure spending the evening with them. The best part of the night was when Sanj noticed Rick and Jane were holding hands during dinner. How sweet is that? Seriously, how often do you see that in Toronto or Montreal or New York? A small town with big surprises for us city folk! We learned about canning, the secret to staying in love, where to shop for bargains and how lovely small towns are down the 401. We’ve even been invited to the town bash in June, celebrating 30 years in business for the Dinkel family and 10 years for Funk & Grüven. We’ll certainly be back! Today I had the privilege of meeting the lovely and talented Holly Dyment who was kind enough to both invite me into her home AND to view the OM home line. While there, she *gently* reminded me that I needed to update my blog (she's right!) so I thought posting about her would be an awesome way to get back into blogging. 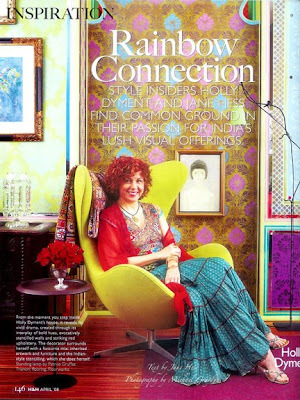 Our shared love of all things Tricia Guild, color and India brought us together on this wonderful spring day. After seeing her amazing house in last month's issue of Canadian House & Home, I was THRILLED to have the chance to see the live show, Holly's house is truly stunning! 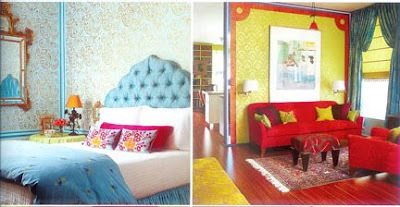 Cascading down the walls in her main living space (pictured above) are different but equally vibrant faux finished murals that Holly stenciled herself. The scanned pictures here don't do the walls justice, there is so much depth to the patterns, it's like sitting in a sari shop in India watching the sari walla wave the latest styles. My favorite is pictured above, the classic Indian look of the light blue and purplish pink against the textured gold background reminds me of one of my mom's most precious saris. I think the egg chair is the most versatile piece in the room. 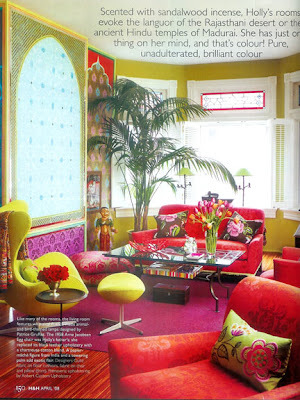 I love the way the chartreuse color both ties in with the wall color and accents the spicy reds, fuchsias and pinks in her living area. I also appreciate the modern touch of the egg chair and how it ties in with the zebra wood floors. 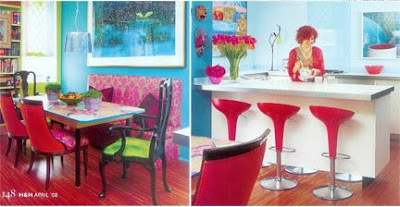 Holly's kitchen is so bright and fun! She hand painted the dining table herself using an inexpensive table as her base. It looks amazing and it's one of a kind! The entryway itself is quite stunning but I was really thrilled by the staircase and walls, green and blue is one of my favorite combinations. 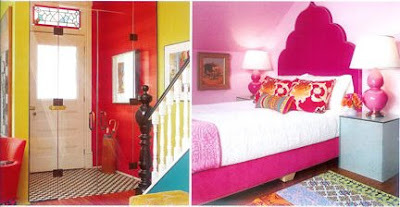 I don't remember the pink bedroom but I love all things pink, especially that headboard! The walls in the bedroom are stunning. The headboard has a similar shape as the one above but is done in a different way. It's so elegant and classic and ties in well with the look and feel of the room. Sanj and I are planning a trip to Morocco and the wall on the right reminds me so much of Riad website that I love for it's colors and patterns, Dar Cordoba. There were other parts of the house that aren't pictured but are equally as stunning. Holly is a kindred spirit indeed and I feel so privileged to have met her and spent time with her in her lovely home. Holly, thanks for reminding me to update my blog!